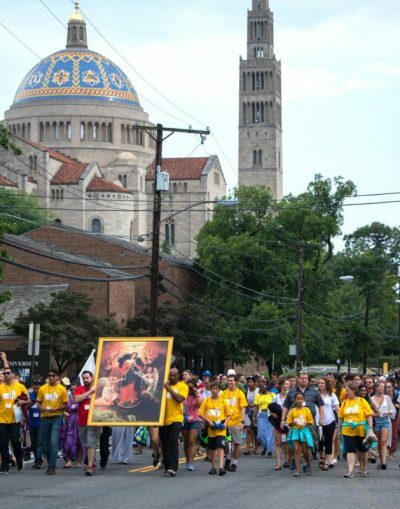 World Youth Day Unite participants march near Washington’s Basilica of the National Shrine of the Immaculate Conception July 22. More than 1,300 young adults from across the country gathered in the nation’s capital for the event designed to bring young people together to celebrate their faith in years when there is no global World Youth Day. (CNS photo/courtesy Daphne Stubbolo, Archdiocese of Washington) . WASHINGTON (CNS) — More than 1,300 young adults from across the country gathered at the St. John Paul II National Shrine in Washington July 22 for World Youth Day Unite, an event designed to bring together young people to celebrate their faith in years when the global World Youth Day does not take place. During World Youth Day, Garcia said he got to experience “the beauty of the church and the universality of it” through being united with people of different cultures, and “people I don’t even know, yet we’re united in Christ.” He hoped the daylong event would be a continuation of that experience. Bishop Nelson J. Perez, soon to be installed as the bishop of Cleveland, and Bishop Frank J. Caggiano of Bridgeport, Connecticut, gave keynote addresses about these words. The common reason why everyone was there, he added, was because “somewhere back in the day or recently, you and I had an encounter with Jesus Christ,” which is the center of the Christian faith. As an example of this, Bishop Perez recalled a conversation he had that he felt went very poorly, but three years later found out it was the closest the other person had ever felt to God. “Never, never, never underestimate the power of God’s Spirit working in you and through you and despite you … most of the time unbeknownst to you and me,” he said. Bishop Perez also spoke about God’s goodness and mercy, and how his love requires a response of trust and gratitude, like that of Mary. Her trust, Bishop Perez noted, was not because she had no worry or doubt. Rather, when the angel Gabriel came to tell her she would give birth to Jesus, she was filled with fear and doubt, he said. Following his address, Sister Gilmary Kay, a Religious Sister of Mercy, who is the Archdiocese of Washington’s delegate for consecrated life, and Julia and Francis Dezelski, a young married couple, joined Bishop Perez on the stage for a panel in which they shared great things they said God has done in their lives. Afterward, the pilgrims braved an impending thunderstorm to walk to the Basilica of the National Shrine of the Immaculate Conception for a prayer during the hour of Mercy, led by the Sisters of Our Lady of Mercy, and for Mass, celebrated by Cardinal Donald W. Wuerl of Washington. He was joined by Bishop Perez, Bishop Caggiano, Bishop Edward C. Malesic of Greensburg, Pennsylvania, and Auxiliary Bishop Mark E. Brennan of Baltimore. In his homily, Cardinal Wuerl told the young adults that they were called to be the “good seed” planted in the world. “You are to be that leaven in the world; that mustard seed that can grow and bloom into so much more,” he said. Instead, “all of us are called to offer explicit witness to the saving love of the Lord who desires, despite our imperfections, that we simply be close to Him,” the cardinal said, adding that the power to do so comes from anointing in the Holy Spirit at Baptism. After Mass, the young adults gathered for a pilgrimage unity walk, led by Bishop Brennan, under the patronage of Mary, Undoer of Knots. The pilgrims each received a ribbon on which they could write a burden of theirs and tie it around their wrists for the walk. When they arrived at the St. John Paul II National Shrine, they were asked to untie them and place them in a basket. Then, they enjoyed dinner and a concert by Tony Melendez. In the evening, Bishop Caggiano gave his keynote address and led the young adults in adoration of the Blessed Sacrament, accompanied by the music of Audrey Assad.